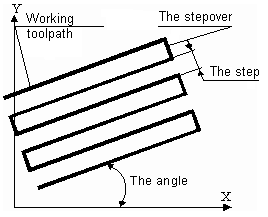 In the plane operations, tool work passes lie in the parallel vertical planes. The orientation of these planes in space is defined by the angle of work passes. The angle is defined in degrees and counted along the X axis in the horizontal plane counter-clockwise. The angle value also affects the order, in which work passes will be joined. For example, with the work passes angle equal to 90 degrees during joining, the number one priority will be the queue of passes towards increment of the X axis, and with 270 degrees – its decrease. The angle of work passes for plane operations can be assigned in the <Strategy> page.